We propose you in seasonal hiring our Bastidon, entirely renovated in 2016 and classified 3 stars by the tourist office in May 2017. It is surrounded by vineyards and lavender and is located 1 km from the village village VILLARS, 7 km from APT and 5 km from RUSTREL. A heated swimming pool of 7m x 3.5m with bubble cover and tarpaulin is available from April to October. The temperature of the water will depend on the weather conditions. The pool is exclusively for renters and will be open in 2019 from April 6th and will close on Saturday, October 26th. Two covered terraces are equipped with garden furniture, tables, chairs, gas griddle, deckchairs are also installed around the pool or under the walnut. You will be able to benefit from a garden without opposite, calm and resting. The hiring has a free internet access, the Wifi code will be delivered to you on your arrival. Pool towels can be provided, upon request, with an extra charge of 3 Euros per towel. The accommodation of 90 m² has two bedrooms, a bedroom upstairs with a bed 160 with bathroom and another room on the ground floor with two beds 90 with bathroom, a living room with kitchen, a living room with television, separate toilet, heating and air conditioning in each room that can be adjusted independently. Kitchen equipment: dishwasher, oven, induction hob, extractor fan, microwave, fridge, freezer, Senseo and filter coffee makers, toaster, kettle, crockery and cutlery. We will make available basic products like coffee, tea, sugar, salt for your arrival. Equipment rental: washing machine, vacuum cleaner, clothes rack outside and inside, high chair, tourist guides and maps IGN, as well as beds umbrellas and bath for baby on request and without supplement. The rental in June, July and August is from Saturday to Saturday. If you want more information, do not hesitate to contact me at 06 70 19 24 48.
Leisure activities nearby: Golf "pitch 130", tree climbing, hiking in the ocher, the Luberon and the mountains of Vaucluse, visits to the villages of Roussillon, Gordes, Joucas, Rustrel with its Provencal Colorado, Bonnieux, Lacoste, Oppède, Buoux, Lourmarin. Despite all the love we have for animals, they are not accepted at Bastidon. Le Bastidon is located in the countryside, you can enjoy the calm and the birds singing. 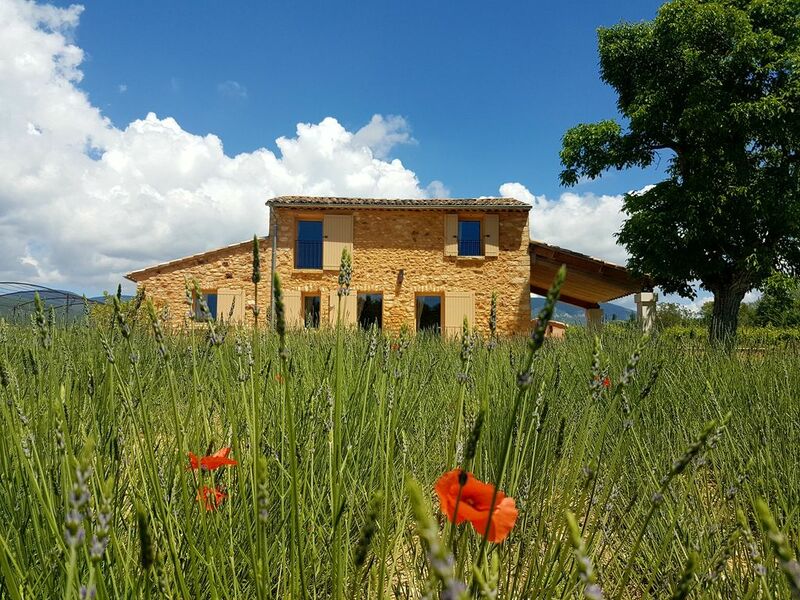 It is very close to the ocher, the Luberon, villages like Rustrel with its Colorado Provençal, Roussillon, Gordes, Bonnieux, Isle sur la Sorgue, Golf Pitch 130 to 800 m of the Bastidon, hiking and cycling. Recently renovated with flair, very functional and extremely clean. We stayed in February and the property was lovely even though spring had yet to come. Stephanie is a very attentive and responsive host. She provided quality accessories (crib, bathtub) for our baby. Did we mention the king size bed and the peace and quiet? We would go back without a doubt. I can't praise the property and Stephanie highly enough. We have stayed in a lot of properties and this was quite possibly the best. The kitchen had everything you could possibly need, everywhere was so clean and everything was so comfortable. The pool was really great too, and the fact that it was heated made it very useable in October. The Bastidon made for a fantastic holiday in the warm autumnal sunshine. We will definitely be back! Le Bastidon is sparking clean, with all the amenities (including a pool ), set amidst the vineyards and lavender fields of Provence. We enjoyed the quiet and natural surroundings, as well as the stocked house! Thanks for a wonderful stay! Stephanie was incredibly kind. She met us at the house and provided us with beverages and an overview of the property. My husband and I originally planned to stay two nights but added another once we saw in person how beautiful the location was. Stephanie graciously accommodated the schedule change. The house was recently renovated so all of the appliances are brand-new and there is radiant heating in the floors. We didn't try it, but there appears to be airconditioning as well. Brand new and full sized kitchen, well appointed with all the usual cooking tools. The linens (including bedding and towels) are all tasteful and of excellent quality. The brightly-colored patio furniture provides a charming pop of cheer against the beautiful views of the Lubéron. During our stay in October, the swimming pool was the perfect temperature for a morning swim. The house is a good size for two couples or for a family with two children. There is a bedroom upstairs with a large bed and a bedroom downstairs with two beds that can be easily pushed together. I recently suffered an injury and was very happy there were accessible bathroom facilities on the ground floor. There is also a shower and toilet upstairs. The house is conveniently located without sacrificing its countryside feel. There is a large grocery store, a gas station, and an ATM in Apt, all of which are easily reached by car in about ten minutes. Villar makes a charming morning walk, and Saint-Saturnin-lès-Apt ten minutes away by car has trails through it's abandoned castle to explore (along with the tiny but bustling village). You could explore all of Provence from this location, but Nime and Arles might be a bit far and lead to a bit much driving. This spot if perfect for relaxing, hiking, and exploring the amazingly beautiful hill towns of the Luberon (google it, Bonnieux and Gordes are must-see and have plenty of places to eat). The drive through the hills to Lourmarin was really fun too (where there is a tuesday evening market from 5 to 8). Other weekly markets can be found on google and of course there are plenty of excellent shops in the Luberon for food if you want to cook. Plenty of wineries with good local luberon wine as well, and even a couple fledgling breweries. I am so happy to received you at the Bastidon. Your comment is so nice thank you so mutch ! And your description is so complete, thanks ! I wish and hope receive you again in our rent in the luberon. Nous avons passé un petit week end hivernal dans ce bastidon fort bien aménagé et rénové au milieu d'une environnement naturel riche, à noter des départs de rando possible depuis le gite, les propriétaires vraiment très gentils, arrangeants et accueillants. Ce coin de luberon est aussi très propice à la balade (meme sous la pluie) et se laisse contempler à la faveur de paysages colorés et ancestraux. Les propriétaires nous ont très bien accueillis dans cette maison entourée de vignes et d’un champs de lavande. Les abords de la maison sont magnifiques et sans vis à vis et tout ça dans une très belle région. La maison est décorée avec goût avec le côté pratique et confort en prime, nous nous sommes directement sentis chez nous. La piscine est très bien entretenue et à température idéale. Tout était parfait et nous prévoyons d’y refaire un séjour. Les séjours au mois de juillet et d'août 2018 sont proposés du samedi au samedi. Les séjours au mois de juin, juillet et d'août 2019 sont proposés du samedi au samedi. Les séjours au mois de juin, juillet et d'août 2020 sont proposés du samedi au samedi.